When you think about it, there was really nowhere to go but down. After the success of Spider-Man 2 – one of the most note-perfect superhero movies ever – where else could director Sam Raimi go when he has the Sony breathing down his neck to deliver another installment of a franchise that has earned them nearly $2 billion worldwide? Make the best movie you can, throw all your marketing muscle behind it to put Spider-Man’s face on everything from a box of Mac ‘N Cheese to a pair of gym shorts and hope it rakes in another big pile of money. Well, the money part is over and done with. Spider-Man 3 had the largest opening day ever – almost $60 million – and the largest three-day weekend ever- almost $150 million. Unfortunately, Raimi might have lost his credibility in the process. 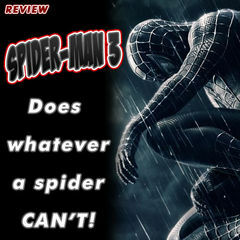 Reviewing a film like Spider-Man 3 is a difficult one for me. I have to wear two hats. One hat says “Objective Movie Critic” and the other hat says “Obsessive Fan Boy.” If the movie gets the details of the comics wrong, you can slap on the critic hat and dissect it that way. If the movie itself is poorly made, you can put on the fanboy hat and look at it that way. Spider-Man 3 was so thoroughly wrong on both fronts, I wanted to take off both hats, burn them and bury them. The largest contributor to Spider-Man 3’s failure is the meandering script by Raimi, his older brother Ivan Raimi and their screenwriting partner Alvin Sargent. 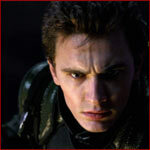 The trio try to build on the foundation of the first two movies by raising the stakes in the conflict between Harry Osborn (James Franco) and Peter Parker (Tobey Maguire) and it’s a good place to start. Unfortunately, after that, things get muddled. Harry has undergone treatments similar to those of his father to avenge his murder. Retrofitting his father’s equipment into a “totally extreme!” air glider, he’s out for blood as the second Green Goblin and Spider-Man is his target. Their battle is the movie’s first action set-piece. 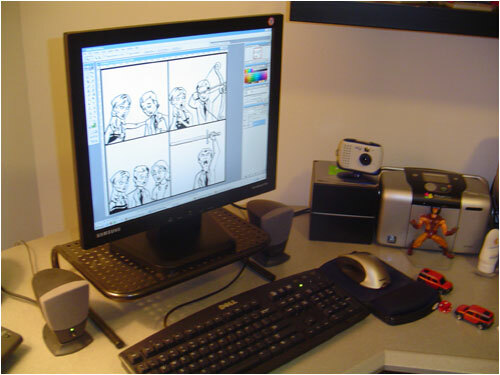 Too bad it looks entirely cartoonish. Like, “I can see the black outlines around the characters” cartoonish. The aftermath leaves Harry a partial amnesiac who remembers his father died, but not by Spider-Man’s hand. Convenient! After that, we’re forced to endure Mary Jane’s (Kirsten Dunst) career letdowns as she’s dropped from a Broadway play after one performance. 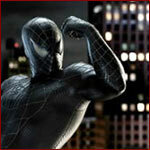 Spider-Man saves Gwen Stacy (Bryce Dallas Howard)– a classmate and photocopier model (?!) in the film’s second (and best) action set-piece and he’s given the key to the city while MJ scowls in the background. Peter then tries to propose at a French restaurant where Bruce Campbell delivers his requisite cameo but botches it and – oh, yeah – there’s some background story about a new villain called the Sandman (Thomas Hayden Church) that can molecularly reassemble his body into an errant special effect from the Mummy movies to steal money for his sick daughter. Oh! Oh! And don’t forget Topher Grace as Peter’s new photographer rival at The Daily Bugle Eddie Brock! Most importantly, don’t forget that black tar alien slinky that crash landed in a meteorite and latched on to Peter’s scooter at the beginning of the movie. Get all that? Oh, wait. There’s more. The black goop from the meteorite is revealed to be a symbiote that amplifies aggression, bonds with Peter and gives him a new black costume. Good timing, too. Because now he can use his amped up powers to take on the Sandman, who he’s learned was the REAL triggerman in his Uncle Ben’s death. Again… Convenient! There’s more, but it’s really not worth getting into. Basically, the movie is just a series of action pieces strung together loosely by non-organic plot elements that move the characters around like chess pieces to get them there. Actually, chess is too generous an analogy. How about Candyland? A big failure in particular is the use – or rather, lack thereof – of the black suit. Peter is probably in the suit a total of 10 minutes. We’re let to believe that it’s corrupting him. After his confrontation with the Sandman, we’re told his intent was to kill him but it looks more like an accident. Later, as we witness how the suit is affecting Peter Parker, Raimi treats it like a campy joke by having Peter strutting down the street like John Travolta in Saturday Night Fever. When he seeks to get back at MJ while she works as a singer/waitress in a jazz bar, he chooses to do so by… stealing the spotlight from her playing piano and dancing around the room? How are we supposed to take this transformation seriously when they don’t take it seriously themselves? Eventually, Peter realizes that he doesn’t like what the symbiote is doing to him, so he sheds the alien creature in a church where Eddie Brock has found refuge after he was exposed doctoring a photo of Spider-Man to paint him in a bad light. 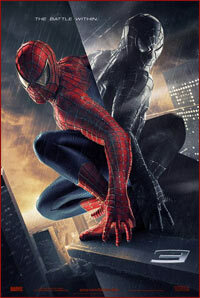 In record time, the symbiote bonds with Brock and they become Venom – ANOTHER villain for Spider-Man to contend with. Venom’s addition feels totally tacked on and if I were Topher Grace, I’d be asking myself “I left That 70’s show for this?” Venom ends up enlisting Sandman’s help to kill Spider-Man using MJ as bait to draw him out. Spider-Man enlists the “on good terms again” Harry Osborne and a big bru-ha-ha ensues. A couple of people die and I leave the theater not caring about any of it. Typing this review was like pulling teeth for me because deep down, I WANTED to like it. But a bad film is a bad film and I can’t help but wonder if Raimi has lost his touch. The movie suffers from Batman Forever syndrome. Throwing more villains at Spider-Man doesn’t make him more interesting. It’s always been Peter Parker’s real-life problems that made him interesting. The filmmakers could have easily gone with the conflict between him and Harry as the centerpiece of the film and left it at that. It would have been a lot less interesting to look at – especially considering Harry’s choice of a paintball mask for his “costume,” but at least it would have been authentic. Or, instead, focus on the symbiote and the Venom character. Illustrate more clearly how Eddie Brock is the polar opposite of Peter Parker. What a real snake-in-the-grass would do with that level of power instead of someone who is at their core decent like Parker. Anything involving Sandman could have been thrown out the window. His story adds nothing to the movie except for commentary about revenge and forgiveness. But, like the original Batman movie before it (where the Joker is revealed as the man who killed Batman’s parents and is then killed), a great disservice is done to the character of Spider-Man by allowing him to confront the man who killed his Uncle and forgiving him. It strips Peter of his guilt for not saving his Uncle when he had the chance. THIS IS HIS ENTIRE MOTIVATION FOR BEING A SUPER HERO! Ultimately, it appeared as if the filmmakers totally lost touch with the characters. For a franchise that presented both sides of a super hero so well, it’s probably the deepest cut that they apparently stopped caring. I could go on with this review, but I’ve stopped caring myself. Spider-Man 3 is the worst of the franchise and certainly did not live up to the hype.